Last Wednesday Cassandra Clare and Holly Black kicked off their “The King and Queen Tour” in London to promote their books Queen of Air and Darkness and The Wicked King respectively so I flew over to meet these amazing ladies, get my books signed and listen to their Q&A. The event was once again at the beautiful St. James’s Church Piccadilly which some fans might remember from two previous tours (August 2017 and July 2013). Cassie always thought that they were annoying and didn’t like the way they speak. She actually made fun of Holly but then The Dark Artifices happened. Cassie is not a big fan of faerie but when outlining TDA, she realised she was going to write a book about faeries. Holly made a lot of fun of Cassie afterwards. They also read the same books for their faerie books so there are some similarities between faeries from The Shadowhunter Chronicles and Holly’s faeries. It's a challenge to write faeries because they cannot lie but are still able to deceive. Holly and Cassie both have a modern take on faeries. Cassie then told us that one of her friends recommended Holly’s first book Tithe to her because there was Star Trek fanfiction in it (which Cassie has actually never watched) and she thought Cassie might like it because she was (and still is) a big nerd. Cassie went to Holly's first ever signing and they hit it right off and went to have hot chocolate afterwards. Questions from the audience now. "What were Will's last words before he passed away?" Cassie never thought about it but they were probably happy words. Julian is a very complex character, but Cassie loves him. She's happy when fans sympathise with him. Holly chimed in and said that as a reader she loves characters who make mistakes. Holly is talking about Jude from The Cruel Prince/The Wicked King. A fan then asked about a rumour that they had read on the Internet a few years ago whether Alec really was based on a childhood friend of Cassie’s. Livvy is very significant in The Wicked Powers and she's also in The Lost World (Ghosts of the Shadow Market #9, June 4). The Lost World is actually told from the point of view of Livvy’s ghost who is looking in on her brother at the Scholomance. She’s like Ty’s roommate and worries that Ty might not make other friends because she’s around. Livvy also travels to Devon to talk to Kit but the further she is away from Ty, the weaker she becomes. Livvy is “attached to him in a magical way.” It is quite a spooky story which isn’t surprising because Cassie wrote it with Kelly Link who loves a ghost story. In The Wicked Powers Idris is warded off from the rest of the world and no one knows what’s happening there, but Livvy is able to go through the wards. The ladies have a looot of writing advice. Holly asks herself what motivates a character to do something, what do they want? Think about where you want to put the emphasis on the story. This can help prevent writer's block. Holly also mentioned that they have to write for their readers selves and not their writer selves. If what they are writing makes them happy, it will most likely also make the readers happy. A fan asked about problematic content in books and I'll write down what the ladies said in our article. The fan asked about finding the balance between what teenagers want to read – that doesn’t always contain what their parents want them to read – while also telling an ethical story that might include, for example, abuse in a relationship without saying something about it in a judgmental manner. A question about Herondales: Kit won't be the typical broody Herondale because Jem and Tessa will bring him up. Cassie also briefly talked about Jaime’s tattoo (La sangre sin fuego hierve) and how it refers to his bad temper. He’s worked hard to control that aspect of himself. We’ll definitely get to know Jaime a lot better in The Wicked Powers because he’s going to be friends with Dru. It's fun to go back to the beginning of Malec's relationship. Magnus and Alec are an established couple in the present books. They adopted two children and Alec has become a confident leader so it was fun for Cassie to revisit a time period where Magnus and Alec were both insecure about each other. She loved going back and thinks it’ll be fun for people to read about Malec. Cassie has been waiting forever to write The Last Hours and she is so excited to work on the series. She's had a really good time writing it. Fabulous fashion, she loves the time period. Cassie was living in London in 2014 when she wrote the first 50,000 words of Chain of Gold and then she had to put it aside to work on The Dark Artifices because the publisher didn’t want to split the books. It was a great moment to return working on Chain of Gold and she really enjoyed it. We will learn a lot about Thule Jace and Ash in Forever Fallen. There's murder and it's a long story (co-written with @sarahreesbrenna). But there's also some cute stuff because Kit is settling in with Jem and Tessa. Half of Forever Fallen is told from Thule Jace’s point of view and we’ll also find out a bit about Ash’s powers and what plans ‘Jace’ has for him in the future. The Lost World is about Ty and Forever Fallen about Kit so readers will see what happened to them after Queen of Air and Darkness. 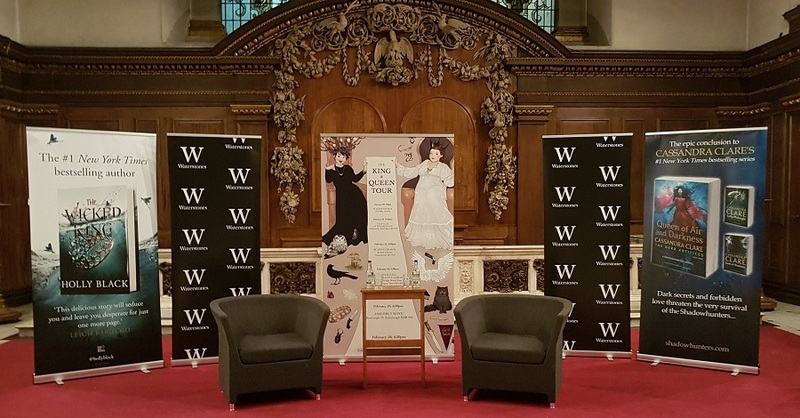 As always I had an absolutely amazing time and want to thank Cassie, Holly, Simon & Schuster UK, Fritha, Waterstones Piccadilly and the staff at St. James’s Church Piccadilly for such a fantastic event. ♥ Until next time!